You can buy and sell just about anything on eBay. Millions of people use it every day. But few of them know all the ins and outs of using the world's biggest and best Internet auction site. The following tools will put you well on your way toward becoming an expert. Find rare items as soon as they are listed: If you're looking for something specific and your searches come up empty, give eBay's saved searches (in the My Account section) a try. Once you set up a saved search, eBay will e-mail you daily for up to one year when new items that match your search appear. Automate last-minute bidding: As eBay veterans know, due to the phenomenon known as "sniping," the only bidding that matters in an online auction happens during the final moments. Free application JBidWatcher tracks multiple auctions and submits your maximum-offer, last-minute bids in sequence automatically. You can also arrange for the app to refrain from bidding on any remaining auctions in a series of related auctions the moment you win one. Track your profits and losses: If selling on eBay is more of a vocation than a hobby for you, head over to ProfBay, a Web site that tracks and graphs your eBay profit margins after subtracting your listing, shipping, and other selling fees from the equation. Get live auction countdowns (without having to refresh the page), advanced alerts, and more with the eBay Desktop application. 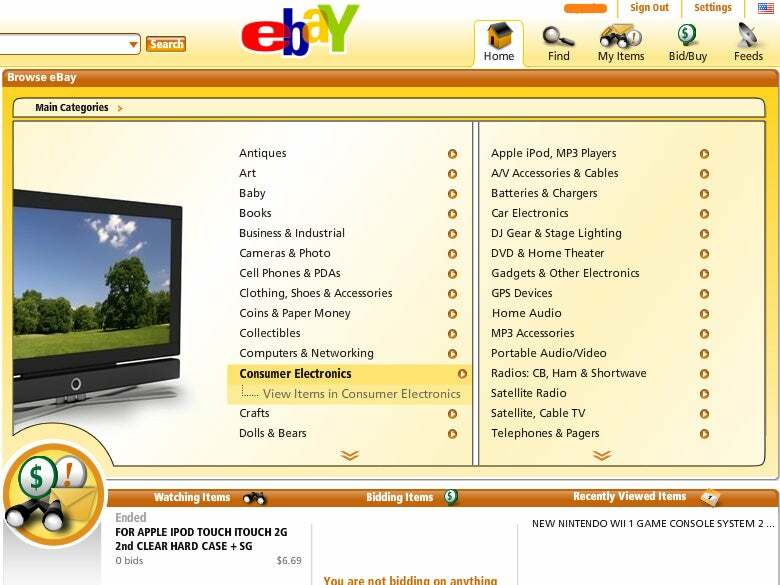 Bring eBay to your desktop: eBay may have lived out the first 10+ years of its life in your browser, but nowadays the best eBay experience comes in the form of eBay Desktop, the auction site's free desktop application. Not only is it faster than the eBay you're used to, but also it supplies a real-time auction counter (so you don't have to refresh your browser in order to see how much time is left), built-in item reminders, and alerts when you've been outbid. And eBay Desktop updates automatically, so you never have to refresh your browser. Get a great deal on misspelled items: The most important thing a seller can do is to make sure that potential buyers can find the item being auctioned. But for buyers, a misspelled auction title spells G-R-E-A-T D-E-A-L. 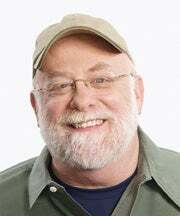 The Typo Buddy site searches eBay (and Craigslist) for all the possible misspellings of your search term--meaning that if you're lucky, you may discover a mislabeled auction that eludes everyone else. 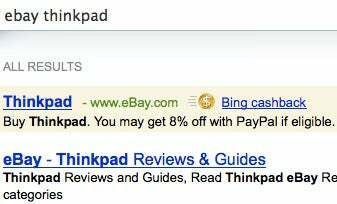 Look for the Bing cash-back link to save money on eBay purchases that you find through Microsoft's new search engine. Get cash back on Buy It Now purchases: Microsoft's new Bing search engine is doing everything it can to attract new users from Google, even paying people to use it. Right now if you search for an eBay item through Bing, you can get up to $200 cash back on qualifying Buy It Now items. You have to click through to the eBay item from Bing, keeping an eye out for a gold cash-back icon, so it's a little more complicated than just buying straight from eBay, but under the right circumstances the savings may be worth it. "[O]ne of the best tools for refining searches is the ‘Refine Search' box on the left-hand side on the first page of search results. This box provides drill-down options for lower-level categories where the item you seek may be located, reducing the need to scroll through long lists of items that may not be related directly to the item for which you search."